To educate and increase awareness, UNAMID is using theatre as a training method. In raising awareness of the United Nations zero tolerance policy with respect to sexual exploitation and abuse, the Conduct and Discipline Team (CDT) in the African Union – United Nations Hybrid Operation in Darfur (UNAMID) has adopted the road less taken, using theatre as a medium of instruction. Aptly named Zero Tolerance, the 45-minute play is tension-soaked and vividly portrays to peacekeepers the repercussions of sexual exploitation and abuse. In a riveting performance, lead character, Section Chief Johnny Boy (JB), his two assistants Titi and Salematu and a local girl Monica, also convey the fundamental betrayal of trust that results when peacekeepers exploit the vulnerability of the people they have been sent to protect. JB, a long-serving senior UN staff member, uses the powers and privileges accorded to him by his office to sexually harass his colleagues Salematu and Titi, creating a hostile and toxic working environment. He goes on to sexually exploit a local underage girl Monica, promising her a job in exchange for sexual favours. This exploitation results in an unplanned pregnancy for Monica, who is cast out by her family. 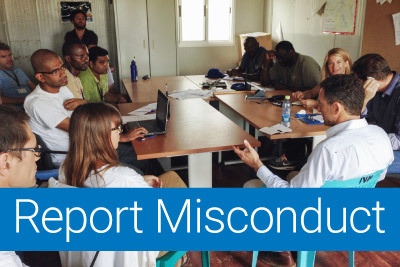 The reputation of the mission among the host community is tainted and JB is dismissed from his job, barred from working for the United Nations and is prosecuted for exploiting a child. Training on protection from sexual exploitation and abuse is mandatory for all UN personnel and with the use of theatre the CDT team has gone a step further. “It is evident that through the play the zero-tolerance message disseminated in trainings, Information Circulars, Secretary-General’s Bulletins, and Administrative Instructions, came alive in an easy to understand format,” explains Mr. Malik. “Through theatre, the cast brings the full weight of what awaits perpetrators to their audiences,” says Mr. Inaju. The use of theatre has proven to be an effective tool to trigger dialogue on sensitive matters and transcend hurdles for change. “Audiences said the drama helped them understand the whole issue around sexual exploitation and abuse, the message was easier to digest and many said they had a more complete understanding of the matter,” states Samuel Conte, a UN Police Advisor from Sierra Leone who played the narrator. Approximately 300 UNAMID personnel have viewed the play, which was performed at El Fasher, the Mission Headquarters, in 2015 and 2016. “It is our intention to stage the play in other sectors to allow more UNAMID personnel to learn from it,” concludes Mr. Malik.